In the superbike wars of the early 70s, Honda had the CB750 and Kawasaki had the Z1. 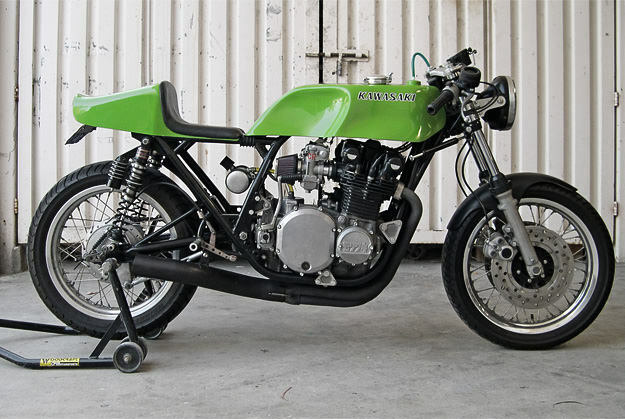 The CB750 gets most of the glory these days, but we love this immaculate 1974 Kawasaki Z1 racing motorcycle. It belongs to a Californian guy called Dutch, and it was a basket case when he found it. “It sat in a barn for 12 years. I rebuilt the top end and turned it into a cool little bare-bones rat rod café thing, and immediately proceeded to crash it in the mountains.” The bike you see here is Version 2.0. It’s modeled on a 70s club racer, but with modern performance tweaks—like a Dyna 2000 ignition and Race Tech valve emulators inside the forks.